I just had to post this picture for ya. Maddux has run with me 2-3 times per week for years!!! Such a faithful buddy. Unconditionally there 24/7. How ’bout you? Are you a pet person? I’d love to hear your pet stories!!! 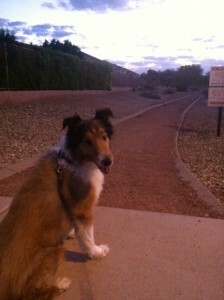 This entry was posted in Life and Whatnot and tagged #DogsRule, Exercise, Lynn Rush, Pets by Lynn Rush. Bookmark the permalink. We had dogs growing up and there’s nothing better than a furry buddy!